EU safeguarding measures against steel imports could become an issue if the EU and the UK fail to reach an agreement on the post Brexit trade relationship. In 2017 and H1 of 2018 the British steel and metals industry benefited from increased market prices which, despite a recent decrease, currently remain at an acceptable level. 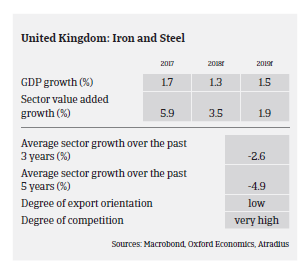 British steel and metals businesses have been generally able to increase their revenues, buoyed not only by higher prices, but also by increases in tonnage sold at acceptable margins. At the same time, Tata Steel´s merger with ThyssenKrupp has removed some of the uncertainty over a major decrease in domestic steel production in the short- to medium-term. The impact of US import tariffs on British steel and aluminium exports is considered low. Most of those exports consist of highly engineered steel and metal items which currently are not produced in the US and not easily substitutable, meaning that tariff-related price increases can be passed on to buyers. Meanwhile, the EU has put safeguarding measures in place in order to protect the European market from excessive imports. That said, those EU safeguarding measures could become a concern if the EU and the UK fail to reach a comprehensive agreement on the post Brexit EU-UK trade relationship or if there is a hard Brexit. Potentially, British steel and metals exports could become subject to the EU measures put in place to protect domestic steel. At the same time, with no preferential tariffs or simply no tariffs at all on non EU trade, the UK and its steel/metals industry could become vulnerable to cheap imports from Asia and the Middle East. 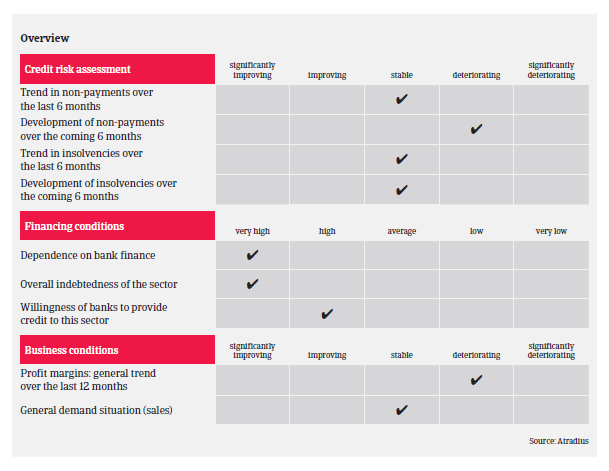 UK steel stockholders are mainly long established and profitable but also heavily reliant on bank finance (mainly invoice discounting) in order to have stock available as and when it is required. Usually they have low overheads, which makes them resilient to economic changes, as they are able to unwind inventories in order to free up cash. Banks are generally willing to provide loans to the industry. Historically service centres and steel stockholders struggled to obtain decent margins against continuously depressed prices. However, the challenge now is to maintain strong margins when price volatility is endemic. Profit margins of many stockholders have come under pressure over the past 12 months due to rising prices, as the costs of replacing the stocks sold has risen faster than what has been termed as the outsell price, causing a lag in time before those prices can be passed on. The average payment duration in the UK steel and metals industry is 60 to 90 days. It is expected that non-payment notifications will level off in the coming months. 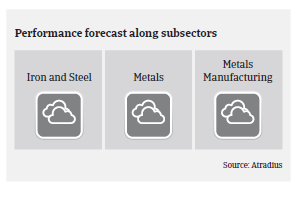 While UK business insolvencies are forecast to increase 8% in 2018 and 4% in 2019, it is expected that the steel and metals sector will not follow this deterioration trend. For the time being our underwriting stance for all main steel and metals subsectors remains neutral. While financial analysis remains a key part of the decision making process understanding the strategic plans of businesses is just as important. A business starting to sell stock below market rates in an attempt to generate cash is a warning sign. Circumstances that could lead to such action might be prices decreasing below the purchase price or high stock costs being carried in a stagnating market.